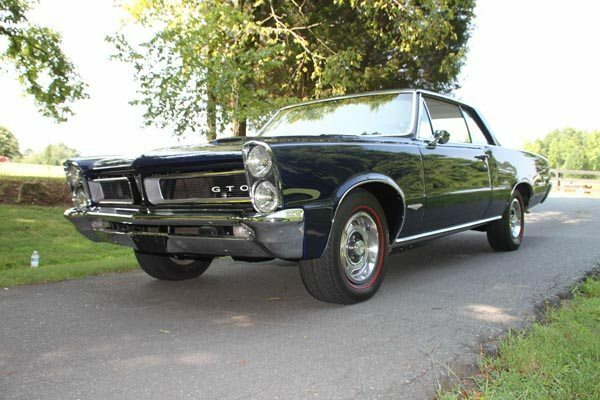 In 1964, the GTO was simply an option package for the LeMans, but it began the process of becoming a real weapon in the muscle car wars of the late 60’s. When the Royal Pontiac of Ace Wilson began to run consistently in the 12’s, Pontiac knew it had a winner. 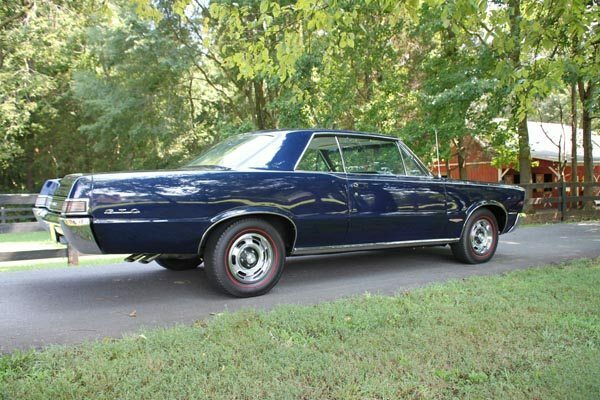 The Tempest line, including the GTO, was restyled for the 1965 model year, adding 3.1 inches (79 mm) to the overall length while retaining the same wheelbase and interior dimensions. It had Pontiac’s characteristic vertically stacked quad headlights. Overall weight increased about 100 lb, but new brakes, shocks and swaybar were up to the challenge. The dashboard design was updated with an optional rally gauge cluster with a tach and oil-pressure gauge. 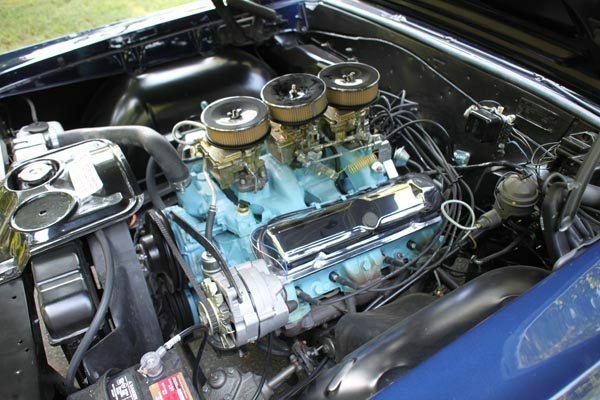 The 389 engines received revised cylinder heads with re-cored intake passages and high rise intake manifolds for improving breathing. Rated power for the Tri-Power engine was now rated 360 hp at 5,200 rpm. The car photographed today has the factory 4-speed option, with Midnight Blue paint and a parchment interior. The restyled ’65 GTO had a new simulated hood scoop. A seldom seen dealer-installed option on this car consists of a metal underhood pan and gaskets to open the scoop, making it in effect a cold-air intake. The scoop is low enough that its effectiveness was questionable, but it allowed more of the engine’s roar to escape. Car Life tested a 1965 GTO with Tri-Power and what they considered the most desirable options (close-ratio four-speed manual transmission, power steering, metallic brakes, rally wheels, 4.11 limited-slip differential, and Rally Gauge Cluster), and they recorded 0–60 miles per hour in 5.8 seconds, the standing quarter mile in 14.5 seconds with a trap speed of 100 miles per hour, and an observed top speed of 114 miles per hour at the engine’s 6,000 rpm red line. Sales of the GTO, abetted by a marketing and promotional campaign that included songs and various merchandise, more than doubled to 75,342. 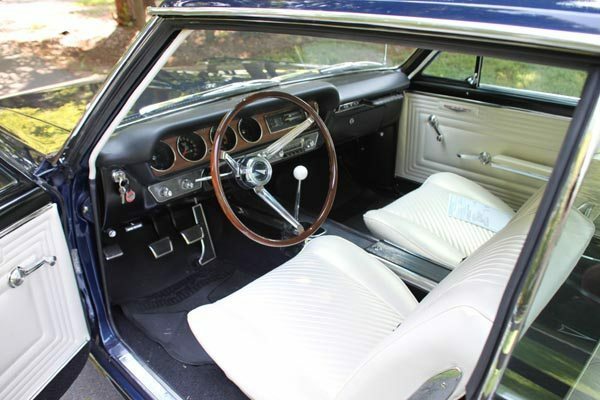 It spawned many imitators, both within other GM divisions and its competitors, and the early performance cars remain highly sought after in the collector car market. 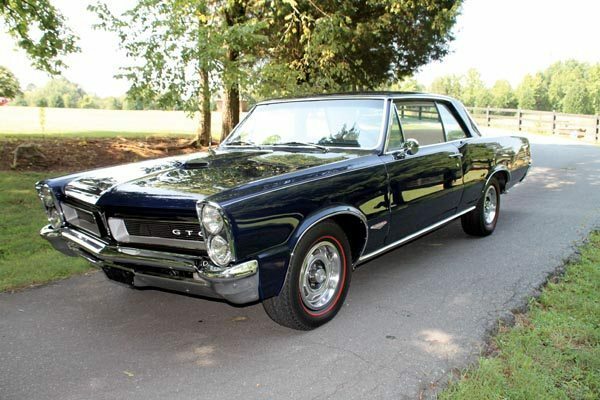 If you have an early model Pontiac GTO or another collectible you’d like to insure with us, let us show you how we are more than just another collector vehicle insurance company. We want to protect your passion! Click below for an online quote, or give us a call at 800.678.5173.